THE GURGLING COD: Freakonomics on food, or: Where have you gone, Benito Mussolini? Freakonomics on food, or: Where have you gone, Benito Mussolini? Reading the Freakonomics guys on food makes The Cod glad there are no chefs on the Federal Reserve Board. Actually, Jody Adams, Judy Rodgers and Marcus Samuelsson might have better luck if they took a stab at setting the prime rate. Myhrvold trained as an astrophysicist and a chef (and a few other things). The long-anticipated book took a few years to produce, and required a team of roughly three dozen chefs, writers and photographers. Its 6 volumes boast more than 2,400 pages, 3,500 color photographs and 1,600 recipes (list price: $625); if you put all the text in a line, Myhrvold tells us, it would be six miles long. A book like this takes a lot of work to put together, most of which, from reading this post, consists of cutting various ovens in half. If you like the whole science thing, Harold McGee is a bit more accessible, and if you like the molecular stuff, this is one of the few cases where Adria's valentine to himself looks like a bargain. This seems less like a cookbook, and more like the most ambitious vanity project since Meshulam Riklis bought the 1981 New Star of the Year Golden Globe for Pia Zadora. More important, (I swear I posted on this before, but can't seem to find it) why would anyone buy a cookbook, no matter how many chefs cutting however expensive ovens in half, or any book at all, where the first word of the title indicates a spectacular indifference to the idea that words have some sort of reference to an external reality? "Modernist Cuisine" would be a good name for a cookbook about the early to middle 20th century. 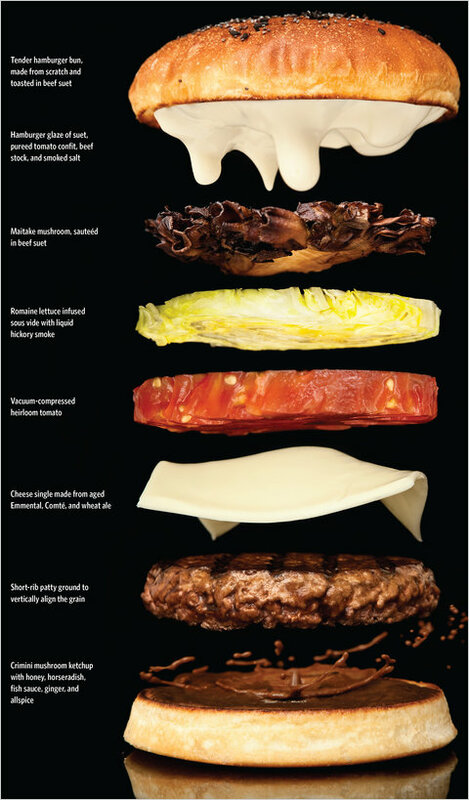 "Modern," modernist" and "modernity" are tricky to distinguish (there is a journal called Modernism/Modernity after all), but "modernist" definitely does not refer to the kind of contemporary, 21st century cooking that Myhrvold celebrates here (see the 30 hr hamburger -- sous vide, natch). Yes, "modernist" is one of those words that has a different meaning if you are an academic, or not, or even depending on what kind of academic you are, but, as I demonstrated above, it's not hard to come up with a less misleading title -- "Contemporary Cuisine" or "21st Century Cuisine," for starters. Save "Modernist Cuisine" for that cooking at home with Il Duce project. Stay tuned for The Cod sticking up for Alice, sort of.